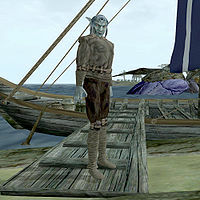 Dunveri Rodran is a Dunmer shipmaster whose vessel, the Wave-Render operates out of Tel Ouada and ferries passengers between there, Bal Oyra and Firewatch. His expert knowledge of the sea means that he is ideally placed to offer advice when it comes to getting rid of unwanted material, and he also knows where ships might come to grief on the treacherous coast around northern Morrowind. This page was last modified on 6 March 2019, at 07:40.